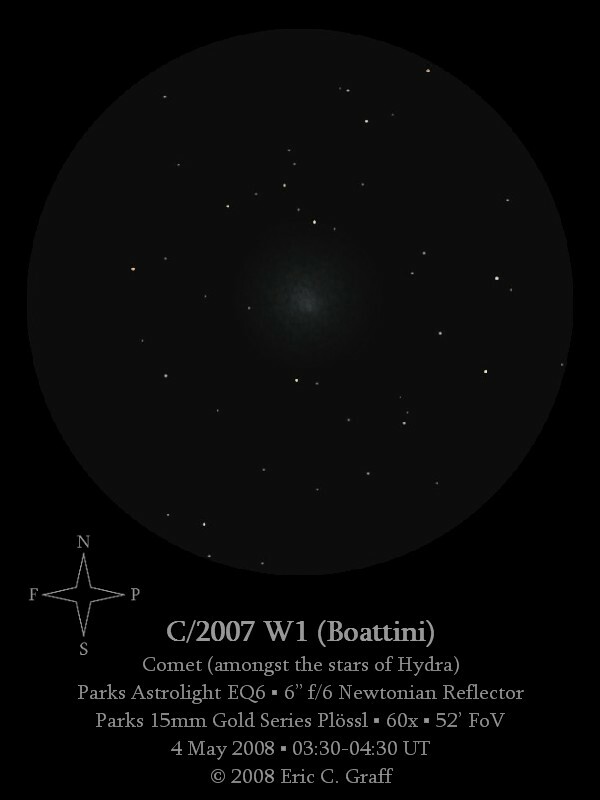 Here is my sketch of comet C/2007 W1 (Boattini) on it leisurely coarse through the starfields of western Hydra. The coma has an overall diameter of at least 12′ and an apparent visual magnitude in the 7.5-8.0 range. The soft, diffuse glow brightens gradually to the center, with occasional glimpses of a smaller, more intense concentration at the core. The whole seems to have a slight aqua tint, but that impression of color tended to be fleeting at best. Just a beautiful superb quality sketch. A very enjoyable observation! Thank you for sharing this one. The comet is too low in the sky at my site.